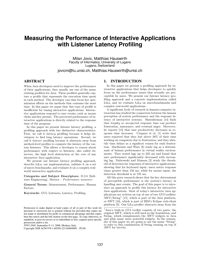 In this paper we present listener latency profiling, a profiling approach with two distinctive characteristics. First, we call it latency profiling because it helps developers to find long latency operations. Second, we call it listener profiling because it abstracts away from method-level profiles to compute the latency of the various listeners. This allows a developer to reason about performance with respect to listeners, also called observers, the high level abstraction at the core of any interactive Java application. We present our listener latency profiling approach, describe LiLa, our implementation, validate it on a set of micro-benchmarks, and evaluate it on a complex realworld interactive application.